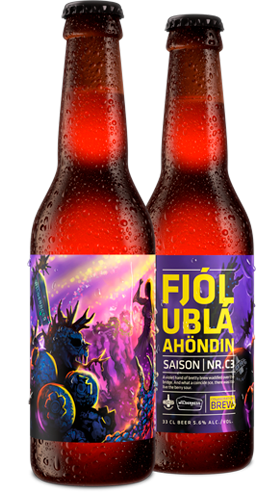 Fjólubláa höndin (The Purple Hand) is unique in Icelandic beer brewing history. Half a ton of Icelandic bilberries was used to brew the beer in collaboration with the famous Arizona Wilderness Brewing Co., with a measure of wild Icelandic arctic thyme. The beer was fermented with Brettanomyces yeast and given a slightly acidic character. Illustration by Gylfi Þór Sigurbjörnsson, brewer at Ölgerðin.